Betsafe casino has been around for quite some time, offering an exciting and innovative gaming platform to thousands of players. Established in 2006, the site is run by the BML Group Ltd and offers one of the comprehensive game selections out there at the moment. 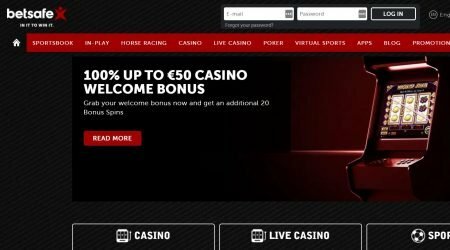 The site itself has clearly defined sections with a live casino, online casino and sports betting section, all just clicks away from each other. The interface is sleek, black and well-designed that players will find it very easy to navigate to the various parts of the site. This is the same for if you are playing on your mobile. Each section offers top quality gaming with the casino sections giving players nothing but the best in games, and the sports betting section offering a wide range of sports on which to place wagers. The site is also highly secure as it is covered by SSL encryption throughout, preventing any unwanted third parties from accessing players' private data. Gaming fairness is ensured through the use of top of the line software providers. Lastly, the casino is licensed with not one, but three separate jurisdictions - the UK Gambling Commission, the Malta Gaming Authority and the Alderney Gambling Control Commission, all of whom ensure that player safety is paramount. When it comes to online casinos, the bonuses are all-important. Having good bonuses makes a casino stand out and brings in new players to the site. With this in mind, Betsafe offers a whole range of bonuses, each one specific to the section of the betting site it is aimed at. 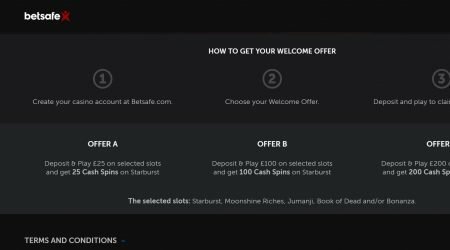 As Betsafe has three distinct sections, it seems only fair that there are three distinct welcome bonuses, though they all pertain to the main casino site. On signing up, players can choose which of them they would like. The first of these is a £25 deposit, which rewards players with 25 bonus spins on Starburst. The second option is a £100 deposit for 100 bonus spins, while the final option is depositing £200 for 200 bonus spins, all on the Starburst slot. While most online casinos will have wagering requirements in place to protect themselves from fraud, Betsafe bucks this trend. Excitingly for newcomers, there are no wagering requirements on the cash spins that are awarded for making the deposits. Instead, players can enjoy any winnings they make by being able to withdraw them whenever they like. Usually, wagering requirements require the player to play through their bonus winnings a specific amount of time before these winnings can be withdrawn from the account. Betsafe offers a number of other promotions to players, particularly to those who stick around. Many of these promotions are only available to players that already have an account and logging in each day will give them notifications of what is on offer. This can include bonus spins, new games and much more. For those that love poker, there is a bonus specific to this part of the site as well. Poker players have a range of welcome bonuses they can receive that is dependent on how much they deposit when signing up. All of them follow the same pattern with the bonus equaling the amount of money a player can earn. Betsafe offers a large number of casino games to players, which are provided by many top providers including industry giants such as NetEnt, Cryptologic, and Evolution Gaming. The slots are featured most heavily, with over a thousand games available, and offers up a number of the world’s favourite games including Starburst, Book of Dead, Jumanji, Moonshine Riches, and Bonanza. There are even some exclusive slots available, as well as a wide range of progressive jackpots just waiting for players to try. The virtual table game selection is also very comprehensive as there are more than 50 games available. Players have access to roulette, blackjack and baccarat versions, each with varying options, table limits, deck numbers, and, in some cases, rules. Video poker enthusiasts have 15 different games to choose from, and these games include some of the classics such as Joker Poker, Deuces Wild and Jacks or Better. Whatever your preference, we’re sure you’re going to find it right at Betsafe casino. The final section of the site is the live casino. 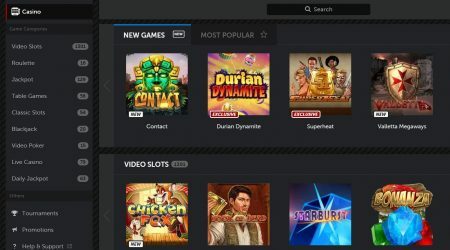 Powered by Evolution Gaming, it is hardly surprising that the site has a whole range of different games available – there are 77 games in total. The usual options are there with various roulette, baccarat and blackjack games available. There are also some of the more unusual options such as Dream Catcher, Three Card Poker and Texas Holdem for those who like to try something a little more challenging in the strategic terms. The sports betting section of the site is also excellent as there is almost every sport you can think of. The odds are highly competitive ensuring that players are getting nothing but the best. Real-time updates occur with some games even broadcasting live. There’s also a section where players can bet on virtual sports as well, taking everything to the next level. Betsafe offers a wide range of payment options, so there’s bound to be one that suits each player. These methods can be used for both deposit and withdrawals and include bank transfers, credit card options such as Visa and Mastercard, Skrill, Neteller, PayPal, Trustly and Entropay. For most of these options, there is a minimum of £20 for both withdrawing and depositing. Maximum transactions will vary and range from just £1000, right up to a massive £1 million for those using bank transfers. There is a convenient table found inside the player’s account that can outline this. Deposits will occur instantly, but withdrawals have a pending time. E-wallets are the fastest with an immediate turnaround after processing. Card payments and bank transfers can take anywhere from 2 to 5 days. Customer support can really make or break an experience. Betsafe, thankfully, offers a 24-hour service to its players. There are a number of contact methods, though the fastest is via the live chat, which states a thirty-second response time (it might not be quite 30 seconds, but it’s still quick. If the live chat is not your thing, then there are other options. An email address is made available, and this also won’t take long to garner a response – the site states this can be anywhere from 30 to 60 minutes, which is a fair sight better than most casinos. The last option is to request a callback, and this has a response time of anywhere from 15 to 60 minutes, which is also pretty good. Betsafe might have been around for a while, but this has only served to make the casino better. This site has moved with the times by providing a fully optimised, easily navigable interface that has the players fully in mind. The casino is fully licensed, offers fast and secure payments, and everything is overseen by the stellar support staff who make sure that players are not left wanting for anything at all. The game selection is huge and impressive and will keep players entertained for hours. The fact that players can jump back and forth between a range of different betting options makes things even more exciting. Great welcome bonuses are available for any newcomers, and if you stick around, there are more to come. Betsafe casino is definitely a place to try out. With so many gaming options, it’s the perfect place to find your groove.